Currently we are sold out of Swearball classic. Of course The Magic S ball and the F-Bomb are still available! Thanks to everyone who stopped by and got your hands on some of our balls! 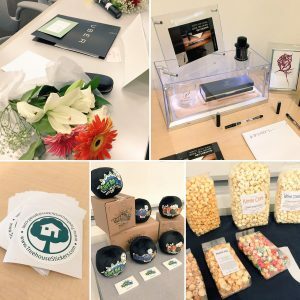 It was great to show off our balls to all the great folks at Last Thursday! Are you out of f*%ks to give? Well Box-o-f*%ksmaybe you should have the new Swearball Box-o-F*%ks! Send it anywhere in the US for $6.66 to anyone who doesn’t give a f*%k anymore! 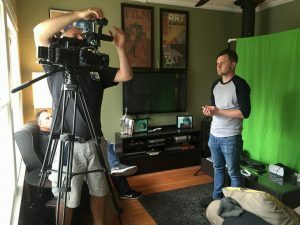 KGW shared some Swearball love! Swearball production team spent Sunday morning getting some great video shot for the upcoming Swearball videos. Andy Thomas and Jon Gudgel are so funny and creative. Great guys to work with. I highly recommend these guys if you need any video work. New Look coming to Swearball! Enjoy the current Swearball.com while you can because in the not to distant future there will be some cool addtions. Adam the all knowing “OZ” behind the curtain of this marvel of technology is working at a fever pace to add some cool stuff. We are also getting ready to offer a contest for free balls…that’s right you could be “free-balling” soon! It’s exciting! I look forward to rolling out the fun changes we have in store. Until then keep your hands on your balls! I’m happy to announce that Swearball was chosen as a finalist in the competitive business pitch program, Pitchfest sponsored by PSU and Uber. 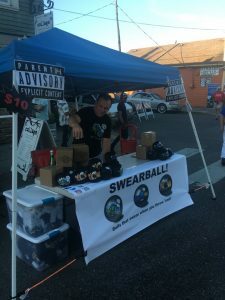 Swearball will go up against 4 other Portland based businesses. Best of luck to all involved and thanks to Uber and PSU for including us. We are humbled and honored just to be a part of it.